Despite her forceful opinions, Huffington remained relatively unknown until she fell in love with English journalist Bernard Levin. After their nine-year relationship ended, she moved to New York City, eventually becoming a prominent figure in social circles there. She later met and married Michael Huffington, a billionaire who ran for the U.S. Senate in 1994. Although his bid was unsuccessful, Arianna benefitted from his media exposure and became well-known in the public eye as an intelligent, conservative woman. She even tried her own hand at politics, running in the 2003 California gubernatorial election against Arnold Schwarzenegger. In 2005, Huffington launched the Huffington Post. She lacked experience in journalism and technology, but her idea of a platform that aggregated content from numerous bloggers was a huge hit. In fact, shortly after its launch, the Huffington Post was averaging 26 million visitors a month. Although millions of bloggers used the site, Huffington didn’t have the funds necessary to grow her website and keep up with the immense increases in site visits. In need of an investor, she sold the Huffington Post to AOL for $315 million dollars in 2011. Huffington earned $21 million from the deal and retained a 14% stake in the company. 2011 turned out to be the last profitable year for the Huffington Post. Tim Armstrong, then the CEO of AOL, kept Huffington on as a member of AOL’s executive committee. He granted her a generous budget, which she used to bring talented journalists to the team, including Tim O’Brien, Tom Zeller, Pater Goodman, and Lisa Belkin. In 2015, the Huffington Post was bought out yet again when Verizon acquired AOL for $4.4 billion. Huffington signed a four-year contract and remained with the company as editor-in-chief and president of the Huffington Post. 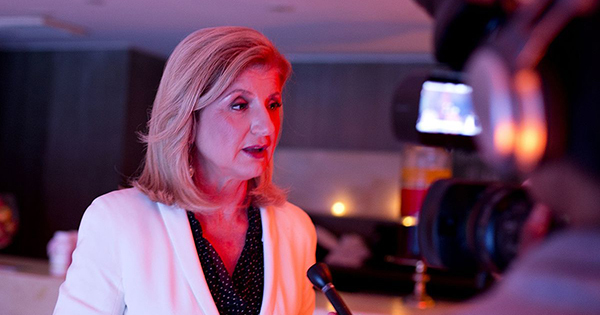 Recently, Huffington has taken a career hiatus by re-focusing on the power of self-care. Her success came at the personal cost of her health - in 2007, she fainted as a result of exhaustion, hitting her head on her work desk and breaking her cheekbone. This experience prompted her to promote stress-free living for other career-focused individuals. Through Thrive Global, a start-up that advocates for the importance of work-life balance, proper sleep, and wellness, Huffington passionately defends her theory that productivity in the workplace is highest when employees take care of themselves.